China cannot resolve its trade dispute with the United States simply by purchasing more goods from U.S. farmers and manufacturers, U.S. Trade Representative Robert Lighthizer said Wednesday. The issues at stake “are too serious to be resolved with promises of additional purchases,” Lighthizer said while testifying before the House Ways and Means Committee. “This administration is pressing for significant structural changes that would allow for a more level playing field. Especially when it comes to issues of intellectual property rights and technology transfers,” Lighthizer said. Lighthizer appeared to be pushing back against the notion that the Trump administration would be willing to accept a weak deal with China to end the trade dispute. China has repeatedly offered to buy more U.S. goods, including soybeans and natural gas. Such purchases would likely lower the trade gap between China and the U.S. but are derided by China hawks as offers to turn the U.S. into an agricultural tributary of the Asian nation. Lighthizer said he’s been pressed not to settle for a “soybean solution.” The administration’s tough stance on China recently received public support from Senator Charles Grassley of Iowa, a significant show of solidarity from a lawmaker hailing from a state hard hit by China’s retaliatory tariffs on U.S. soybeans. Lighthizer warned that it is still too early to tell if China will concede to U.S. demands and said enforcement is still a sticking point. “If we can complete this effort—and again, I say if—and can reach a satisfactory solution to the all-important and outstanding issue of enforceability, as well as some other concerns, we might be able to have an agreement that does turn the corner in our economic relationship,” Lighthizer said. Lighthizer also said that it is likely the U.S. will have to continue to negotiate with China over trade matters even if a deal is reached. 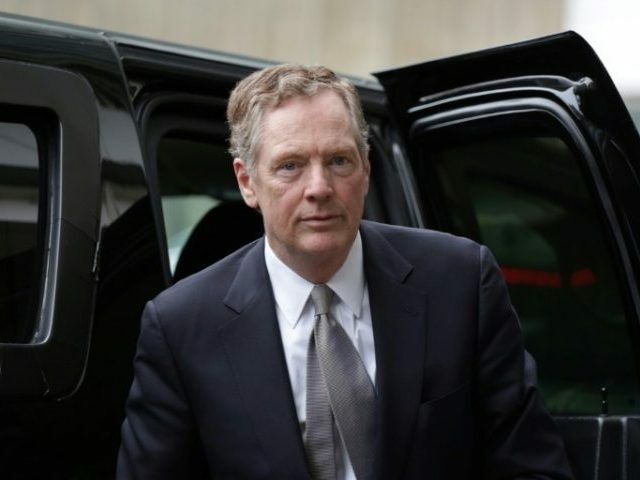 Lighthizer’s words and tone appeared to contrast with the optimism of President Donald Trump, who this week praised the “progress” negotiators had made and agreed to delay raising the tariffs on $200 billion of Chinese goods from 10 percent to 25 percent, a hike originally slated for March 1. Trump administration officials have said a deal could be signed by Trump and Chinese dictator Xi Jinping in late March at a meeting at Trump’s Mar-a-Lago resort in Florida. Lighthizer also pointed to the past failures of American presidents to get China to reform. The Bush and Obama administrations both elicited promises of reform that were later broken or unfulfilled. The Trump administration is “very aware of the history of our trading relationship with China, and the disappointments that have resulted from promises that were not kept,” Lighthizer said. Both Republicans and Democrats on the House committee urged the administration to hold out for a strong deal rather than compromise for a weaker deal without enforcement provisions. Lighthizer’s prepared remarks included praise for House Speaker Nancy Pelosi.